Reb Yochonon Twersky HY"D was the son of Reb Moshe Mordche HY"D the Trisker Rebbe of Lublin. He's not to be confused with his brother the Trisker Rebbe HY"D of Warsaw who was married to Chaykele Twersky. In those days if two brothers were to be Rebbes - especially with the same title - they had the common decency to travel to another city and set up shop there. Today's Rebbes seem to thrive on the turf wars. Anyway, as we were told by some well-informed commenters here, Reb Yochonon was known as "Yochonon Aleph", not to be confused with "Yochonon Beis", another Twersky son-in-law of RYDB. He later became Rebbe in Horibishov and is featured in two beautiful photos with his Brother-In-Law Reb Aron Belzer ztvk"l wearing a Rabbonishe Peltz and "Porochesel" on his shirt KeMinhag HaChassidim. We here read about Reb Noochem Yitzchok and his fear of marrying into the Belzer Rov's family. Part of what worried him was (Ihr Zolt Mir Antschuldigen) the fact that he and she would have to have a matching his and hers Karachat. Again, I apologize. We also read how in Belz they banned all sorts of wigs, and only the old-fashioned kerchief was acceptable headcovering for women. So much so, that even the wedding party, siblings of a son-in-law of Rav Yissocher Dov Belzer zt"l were forced to change into kerchiefs upon entering Belz. That does seem to be the case, that Belz was quite extreme in Pre-WWII Europe, and that they banned any all modernity. Why just recently, in honor of the Belzer Rov's Fiftieth Yohrtzeit, one of the publications had a very interesting list of Takonos that was on display in the Belzer Shtiebel in Munkacs, and was agreed to the by Reb YD Belzer zt"l. Suffice it to say that they would make today's Belz look like Frayakes. So, there really would be no reason to say that RNYT's fears were exaggerated were it not for the following piece of photographic evidence that recently reached the Tzig's desk. Yochonon seems to have been younger than Noochem Yitzchok, NY was married in 1910 at the age of 20, and Yochonon looks to have been pretty young in the 1930's, with very little facial hair even then. As a matter of fact I'm not sure he even knew his shver. Otherwise I would've told NY to Chap Ah Shmooz with Yochonon his Brother-in-Law, so that he tell him how to manage in Belz without capitulating to all the Belzer Takonos. 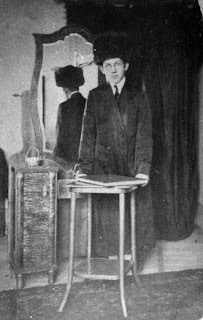 Then again, if Yochonon was married after WWI, and after the wanderings that the Belzer Hoyf had to endure to Hungary, then maybe it would be difficult to compare the two Shvoggers and what they had to endure. Maybe once the Belzer Rov came back to Galicia he realized that times HAD changed, and that it would be difficult to put the "cat back in the bag." After all, we do see that the daughter of the Belzer Rov is seen here wearing a Sheitel and "modern" 20's clothing, not to mention doing the unthinkable with the arm on the shoulder. So I guess whoever said timing is everything knew what he was talking about; Just a few years later and Noochem Yitzchok could've saved himself lots of Agmas Nefesh, and ultimately embarrassment. In picture number 1 he looks like he is about to collapse and is holding himself up or else fall flat like pancake, poor kid! In picture number 2 she looks like she's about to wrestle him to the gro and flatten him like a pancake, poor kid x 2! She looks more like his mother than his wife. He looks maximum 15. I too suspected it was his mother but was told it was his wife. I think his mother was a bit older than that. Women didn't age as gracefully then. how have u verifeid the I'd of the picture? These are obvously interesting pictures. Note the necktie in picture 1. Belz has published much historical material and you can get details about this person's life and time line. That said, in printing these pictures you clearly fogot about the feelings of the international Belz community. And the discomfort they may cause.I can forgive a secualr scholar or journalist , but a charedi Jew ? 1) I'm not sure that's a necktie. 2) I don't remember you minding that the Lubavitcher pictures were printed, VeAderaba. 3) I remember you writing here about an upcoming publication that would "embarrass" the Lubavitcher community, so I don't think you waited for my heter. These are two fully-clad conservative-looking Yiddishe individuals who are not doing anything immoral. So this is all pretty tame stuff. He was obviously an eidel boy and not a chulent and kiegel fresser. R' Yoichanan is wearing what's becoming of a real Twersky - a pair of pants (vs. shvartze zokn, a must for a misbelzim bnesheks of those days), a russishe surtuk with two lines of buttons (vs. Belzer kaftan with three lines of which third one is not to be closed under yeherog ve'al yaavor) and a nice pair of spectacles. Woman in the picture is also dressed impeccably for the day and age; her sheitel (if it is indeed a sheitel) is covered to the point of being a "shpitzl". And don't forget that it is not just customary but mandatory for essentially all chassidishe yidden (with certain exceptions that shouldn't be touched upon here) to hold hands after the chuppa and through-out the parts of chasune they get to sit together, so Tzig's insinuations are baseless. R' Yochonon should be credited extra for "lo shinu es levusho" in the Belzer "mitzrayim". what exactly did I insinuate? Tzig it looks like a necktie to me. Insinuations that there is something wrong somehow with arm on the shoulder in a wedding picture, or that the dress or the headgear of the woman pictured is somehow unbecoming of her family statute. Even if that was bei-hur (probably not) and not a heavily armored sheitel. all I did say was that it would seem - based on the perception, based on what we're taught today - that Belzer Kinder wouldn't pose like that. Never did I insinuate that there was something wrong. Why would I? Oh, you mean קרחת. When did you pick up the Zionist havarah? I used it as a Loshon Nekiah. Tzig. Adeaba. I urged Hagaon hamechaber not to include certain pictures. In addition yours truely has some pictures that the eynikel gave me that will never see the light of day (even with your green light) because I have little interest in hurting the deceased people, the Royal family and the community of the Faithful. The last group should stand and fall on their own actviites. By the way I have never seen a picture of a chasunah in the Yeshiva world of lIt where the Kallah is resting on the Chasasn. I have a photo of my cousin a Navarodoker (Chabad) on his marriage day - no touching etc. I posit this picture you published is takke unusual among frume Yidden. Perhaps I am wrong. We are looking at these picture through a hundred year old prism of layer upon layer of statements, teshuvos, pashkvillen, takonos, machoos and other gunk that formed this image of "Bus Yisruel" that people in Willy try so hard to imitate and people in CH and BP try so hard to distantiate from. Back then, things were so different that people born in the frum context of US or the Zionist Entity can't even fathom it. Amongst other things, the older generation was so grateful to the jungwarg that were interested in maintaining a yiddishe lifestyle that the small issues weren't even brought up often. Galitzian war on sheitels that got exported to Hungary was nowhere as "nuclear" as someone reading the teshuvos and letter would assume; and the stories such as the one with a mandated arupgebinden hairdo (what you call kerchief) that you refer were largely an exception set to make an example, not a rule. Lucky lady, those hats were actually in style in those days. She could easily pass on the street as just another well dressed woman. I'm not sure how this photo can be considered a "wedding photo". Notice, that she is wearing a black, short dress. Do you think that this is what she wore to her wedding? If indeed they went to a photographer some time after the wedding, what is her placing her hand on his shoulder meant to prove? Nothing. It's just a loving gesture and has nothing to do with chassanim and kallas who come in after the chuppa with his hand clamped on hers, staking his claim. I hate to burst your bubble, but if you look closely you will see that he is indeed wearing Vaise Zoken in the first photo. Notice how one of the pictures has been developed back to front, so the sartuk closes the wrong way in picture no 1. Off topic: See here - PAGE 25 - for Lubavitch, yeshivos, early days New York, in HaPardes '44. Fascinating and postable - http://www.hebrewbooks.org/root/data/pdfs/AS/pardesseventeen11.pdf#xml=http://www.hebrewbooks.org/dtsearch.asp?cmd=pdfhits&DocId=8462&HitCount=2&hits=8a2f+8a30+&hc=44&req=%28%D7%95%D7%94%D7%90%D7%A6%D7%9E%D7%AA+%D7%94%D7%93%D7%A9%D7%91%29+OR+%28%D7%AA%D7%9E%D7%A6%D7%90%D7%94%D7%95+%D7%91%D7%A9%D7%93%D7%94%29. fowl from bed stuy, he is wearing shabbes kleider in the first photo, complete with a spodik. What is your problem exactly ? why the need for comments like that? why is it so difficult for you to just say without that scrowl on your face?! The first photo is a BAR-Mitzvah photo. The spodik is called a kolpik which the children of Tcehrnobler kinder und Belzer kinder wear at their bar-mitzvah. The second photo might also be a bar-mitzvah photo and the woman in the picture is definitly older than this young lad. tzig, anybody "bursting bubbles" unlicenced will get those kind of comments. Why can't it just ask without that scrowl on its face ? anonymous may well be right about the photo being a B"M photo. could be, but doesn't have to. Unlicensed, eh? Is there some kind of office in the Kremlin we need to go to just to get that license so that we can burst your bubble? I have absolutely no issue with his attire. I was just responding to your observation that he was wearing long pants as opposed to Shvartze Zokin. ... and the fact that pic 2 cannot have been a wedding one if he's not wearing shabbesdige kleider. If this woman in the photo were actually his mother it would explain her ability to publicly touch him without compunction. 1) I see now that it is a necktie. The Poroches'el may have come later, when he married into Belz. The woman is ABSOLUTELY NOT his mother. The picture is not a wedding picture, I never said it was. It was around the time of marriage. Ok, OK, Cool it, calm down. Seems like everyone here has a short fuse. I got your point. It's NOT his mother. Sorry to beat a dead horse. So what's the chance you can set up a link of this photo of one in Rebbishe Pelz and Poroches'el. Or must we wait for it to surface in a later posting. I've seen photos of his mother, and she looks nothing like the woman pictured here. Nothing to do with age. I have the Peltz & Poroches'el pics. I'll post them today, be"h.
Maybe this is an older sister? Defenitely looks like the way the chernobler rebetzins dressed at the time, and still do up until today. Can't believe this should be a belzer daughter wearing a sheitel and not wearing "shvartze shtrimp"!! There are a few things wrong in the secon photo. It is possible that it has been digitally re-done. Notice the womans fingers crossed in a way no chassidic person [especially a Belzer or Tchernobler] would ever do for fear of bringing evil to the person doing it, as they bring from the Zohar. Second, look at her hand on the shoulder the part closer to her is covered by some material which does not belong there, and experts would testify that this is an effort to digitally correct or re-do the picture. The woman, whoever she is, looks to be wearing an "aviator" style hat that was popular among fashionable women in 1920s-early 30s America and Western Europe. It definitely is not a shaitel. This is probably way off course, but what's the chance this is some "modern" aunt or other relative? Maybe even a grandmother? BTW, the fabric that drapes over her hand looks like there was a bow tied over one ear made of a sheer fabric like chiffon. i have 1 problem with photo. you would notice that "husband & wife" are not focusing in same direction. am I being accused of doctoring photos here? I need to know, because people seem to have such a problem with it that they're resorting to claims of photo-doctoring by yours truly. Ridiculous is an understatement. why is the two of them looking in different directions a Kashe on the picture. The Ukranian/Polish photographer told them to pose that way. Relax Tzig, no one was accusing you of doctoring the pictures. They may be accusing the ones who are forwarding these pictures. To use the direction of their focus as proof of photo doctoring is ridiculous. They each might have been attracted/distracted by different objects. One might have been looking at the black shmate over the camera, the other might have been looking at the "little birdie" (flash). The two of them are also not of equal height. I'm not a photographer and don't know if that makes a difference, but I would think that they would have to look at the same subject from slightly different angles. whoa, whoa! i have no idea where you got this pic from. if you scanned it in to your computer yourself, sorry! i assumed you got it online somewhere. Hesh, i would never think that of you! Pics like these are jewels, and jewels are not tampered with. Nobody's trying to embarrass anyone here, so nobody's doctoring any photos. tzig, you should continue publishing photos (the ones you know to not be fake); it's the only redeeming deed you'll have to show for your years in this world. what can I say? you're a disgrace to humanity, but I thank you for showing us all what a neurotic madman you are. Thanks for the compliment. By the way: why were the Galicianers allowed to hijack the Chassidishe Levush? Why was the 2 button Rekkel banished to the dustbins of history? scroll up just a bit and see what you wrote. it's the only redeeming deed you'll have to show for your years in this world. Remember now? good. Care to tell me what kind of language that is? Is that something you picked up from your buddy M A Friedman? And what's this about Nadler being my buddy? You're beginning to sound like a total paranoid lunatic. Stick to the subject at hand, and try and sound coherent. tzigele, if I'll pick out every piece of dirt, filth and lie that you've written or printed over existence of this blog (especially since you picked up the dreck from the defunct TA), that will make you not just a "disgrace to humanity" but a candidate for immediate expulsion from any self-respecting institution other then the one on ward's island. so if you took offense here, that goes to show just what kind of perversely skewed, blind and biased self-serving mediocrity you are. And that's a good thing. This language will remind you that while you've manage to offend memories of the dead and of the living to no limit, you still do have some redeeming deeds, that is when you publish and picture and then don't manage to turn it into a forum for smearing anyone related to those on the picture. ONLY a product of Soviet institutions like yourself can skew me into what you describe, all the while making writing and pontificating as he were "squeaky clean." You have the sense of truth of Kol Kahir during the Six-Day War. Khaver Gamel Abdel Nasser would be proud of you. and it's funny of your to speak of products of Soviet institutions, given that you yourself are a VOLUNTARY product of the Sovietest of the most Soviet institutions, the one that carried and carries on the light long since the Soviet Union itself is gone. Do you even realize that people who shaped your post-conversion existence are in effect products of the Soviet institutions (of which you know nothing) in the strictest and harshest of senses ? au contraire, Mayn Lieber Yid. I'd LOVE to sit down and have a one-on-one with you. I'm sure some readers would be fascinated. tzig, at some of your readers' suggestion i almost would've, but the same very day you started spewing such repulsive vomit that i'm afraid i won't be able to not get violent in a tête-à-tête meeting, even as i'm usually the very opposite of violence. I'd really like which hate and venom you speak of. I have no recollection, and I think you're exaggerating greatly. I spew no hate, unlike yourself who shocked even me, me who had seen it all said for a long time. But never mind that, let bygones be bygones. When can we set up the interview? tzig, you have proven to be uncapable of even a second of unbiased thinking; you proved that you're a two-faced lowlife and that there are very few if any acts that are beneath you. furthermore, you insist on offending dead holy people. And if you really think that you "spew no hate", you must either be a blatant and pathological liar who doesn't even care for מילתא דעבידא , or a seriously deranged narcissist. i don't care for the latter but i really can't stand people who lie in one's face. so if you really really insist, send me an email or drop me a call and we'll have us an interview right by the engine cul de sac (if your mal de mer won't take over) ; but until you show haute école for admission of fault or anything remotely resembling fairness and intellectual honesty, i see little benefit in crawling from underneath the nome de guerre and disrupting the status quo. Where can I get the list of the Takonos that was on display in the Belzer Shtiebel in Munkacs? My grandfather used to daven there. Where? Your link is to more comments. Need info for big minkatch reunion on superbowl sunday. oh, sorry. I meant the post that the comments are about. The picture there is of the book that may have it. Then again, now I'm thinking that maybe it was the other one that came out the same time. That one may have been published by Belz-Machnivke. The reunion is for the SB, or is just a coincidence? do Minkatchers like FusBol? GREAT! I have that magazine, I'll look there. No Feesball, actually Minkatchers enjoy WWF wresting like most other Ingarishers. The reunion is actually a Bar Mitzvah that will coincide with the SB. I'll be sure to enfore the Takonos. Ingarishers like wrestling? Lo Yoodaati! again, I think it's there, it may be in another one. BTW where is that event in Chicago? Or in the Valley CA ? If you ever find it please post it or something. Thanks anon, yes I am familiar with Shpitzles, but for some odd reason I can't convince my wife to wear one. Oh well, her loss. Reunion was in NY, but there were plenty of Valley Reps.
sorry about that, I'll check the other book hopefully one night this week. The Mad Hungarian strikes again!